The first time you use your menstrual cup it will probably feel a bit weird. This is normal, and you'll get used to it pretty quickly. Most women need one to three cycles before it feels really normal and easy. If you've ever used tampons, you may remember it took a while to get used to those, too. However your menstrual cup comes with no inherent danger of toxic shock syndrome, and it won't cause dryness or irritation if used correctly. 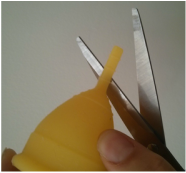 When you are ready to use your cup for the first time, you may choose to sterilise it first. This can be done by simply boiling it in clean water for 3 to 5 minutes. You can also do this at the end or beginning of each cycle. During your cycle, simply empty it, rinse with water or wipe it down and reinsert. At the end of your cycle, store your cup in breathable fabric (like the bag it comes in) ready for your next cycle. The first time you insert your cup, make sure you are somewhere you can relax in private. Many women find the bath or shower is a great place, as they can use the water as a lubricant. Some women find lubrication can help with insertion, so you can use a water-based lubricant on the rim of the cup if you choose. Be careful to use lubricants that are safe to use with silicone. If you are inserting your cup when you have your period however, many women find their natural lubrication is enough. Get into a relaxed and comfortable position; this could be squatting, standing on one leg with the other leg on the edge of the bath, a standing squat, or whatever works for you. Fold the cup using your preferred method. You can experiment with this to find out what works for you. Feel free to write to us if you find a great new trick! When you first start using your cup, you may feel like you want to check to see how full it is. Women are often surprised by how little fluid they actually release, and also how innocuous it is. Menstrual fluid in a cup should have very little or no odour, and often has the appearance of red egg white. You will get used to how often you need to empty your cup, but usually it will be about a third as often as you would have changed your tampon. Removing your cup. The first time you remove your cup, you will need to be somewhere you can relax and feel comfortable. If you still have the tab on your cup, gently pull the tab down until you can feel the base of the cup. Release the seal of your cup (this is why it has the little air holes), by squeezing the base of the cup between your thumb and forefinger. Once you have released the seal, simply "walk" the cup out with several movements, holding it by the base. You may find pushing down on the cup with your vaginal muscles makes this easier. Make sure you hold the cup upright at the final step, so it doesn't spill. If you do it in the shower for the first time, you don't need to worry about this. Once you have removed the cup, simply pour the fluid down the sink or into the toilet (if you pour it onto toilet paper in the bowl, it won't sit at the bottom after flushing), then rinse or wipe your cup down and reinsert. Wash your hands, and you're all done! The average length of a vaginal canal is only three inches or 8 cm. Due to the cup needing to sit below the cervix, and be worn internally, many women find they need to trim or completely remove their stem to do this. The stem should not be pressing against your labia at all. The most important thing to consider is that you can still remove the cup by squeezing the base, so women with a longer vaginal canal may need to keep their stem intact to pull it down to a position where they can squeeze the base and break the seal. By trimming the stem gradually, you can stop when when you get the length right for you.